On Wednesday, October 25th families joined us at the Adriance Memorial Library in Poughkeepsie for an afternoon of storytelling, traditional craft making and cooking! Children and adults listen attentively as Vickie Raabin tells the story of the corn husk doll. Children and their families joined us in the Library’s Cavallero Children’s Program Room to hear local elder Vickie Raabin tell some native American stories. The children were captivated by Vickie’s retelling of Corn Husk Doll, a tale that explains why corn husk dolls have no face. The story warns against vanity, and stresses the importance of doing your duty for your community. Vickie Raabin holds up a finished corn husk dolls as an example. Following the stories, Vickie explained how important it is for her community, and all of us, to use every part of the crop to ensure nothing goes to waste. For example, with corn, the corn silk is harvested, the kernels are eaten, the cobs dried and burned, and the husks are used to make corn husk dolls! With the help of Vickie, parents, and guardians, the children had the chance to make their own corn husk dolls. The dolls are made of slightly damp corn husks tied into segments using string to make a head, waist, and arms. The dolls all turned out beautifully, and everyone got to practice their knot-tying skills. Kids get to work tying the first part of their corn husk dolls. Vickie Raabin provides some extra assistance in the doll-making process. 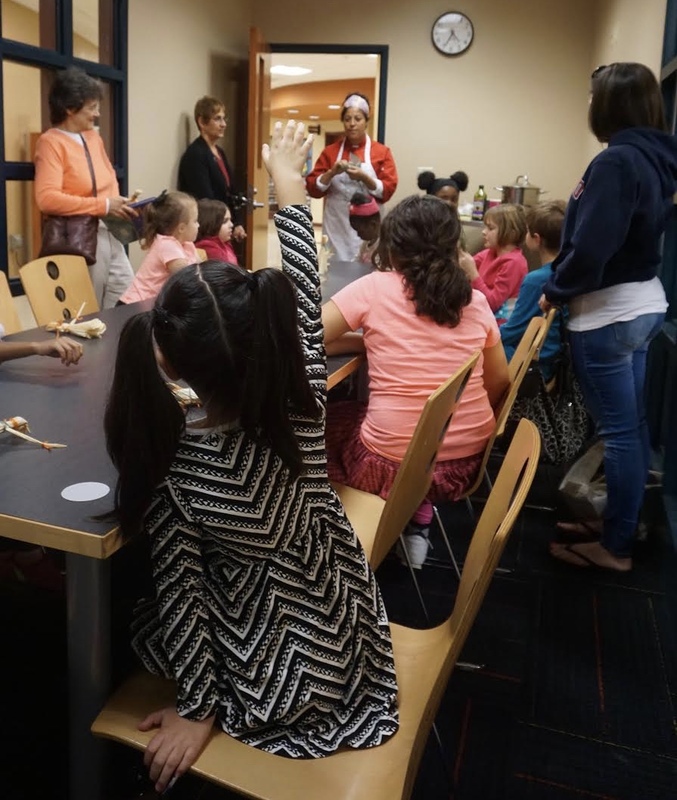 After making our dolls, we moved to the teen study room to learn from Poughkeepsie Farm Project education director Jamie Levato and Chef Katie Key about popping corn. We brought with us from the farm some dried out popping corn stalks so we could see for ourselves exactly where popcorn comes from. Popcorn is a different variety of corn, and grows for the whole season until the kernels become dried out and ready to harvest. Children inspect the rainbow popcorn kernels they are about to eat. Chef Katie then began to whip up a batch of rainbow popcorn! A bowl of the un-popped kernels was passed around, and while the children admired the variety of colours, Chef Katie explained that popcorn pops because the moisture trapped inside the corn kernel needs to get out once it turns into water vapour. Chef Katie Key passes out handfuls of her delicious popcorn. After two batches of popcorn, one regular, and one with Chef Katie’s special mix of butter, rosemary, and thyme, everyone headed home with full bellies, a corn husk doll and a handful of popcorn kernels from the farm to plant in their own gardens come springtime. A finished corn husk doll sits on the window sill surrounded by harvested husks, corn silk and string. Growers Row: Hey André! Hey Plant Sale! Carrots, Sunflower, Watering Vegetables by Symbolon; from the Noun Project. Icons have been colorized.